Zero-emissions energy enthusiasts remember the early demonstrations of hydrogen fuel cell technology. As far back as the 1990s, excitement was building for fuel cells. Today, some may be wondering, what has happened since those days? What are the latest developments in fuel cell technology, and are we approaching widespread fuel cell commercialization? In a word, yes. The benefits of fuel cells are proven. Hydrogen fuel cell solutions are in use today, in real-world applications ranging from industrial-scale backup power systems to mobile power for electric trains, buses, material handling systems and heavy-duty transport trucks. In the video below, learn how to choose a supplier that can deliver the right fuel cell product for your company. At Ballard we are working on improving key elements of our fuel cell stack technology. In this article, we will focus on advancements in our catalyst technology. A future article will discuss other fuel cell component advances. Hydrogen fuel cell design employs catalyst layers coated on either side of a proton-exchange membrane (PEM), to catalyze the desired oxygen reduction and hydrogen oxidation reactions at the cathode and anode, respectively. The catalyst coated membrane is further sandwiched between two carbon paper based gas diffusion layers (GDLs) to create the membrane electrode assembly (MEA). 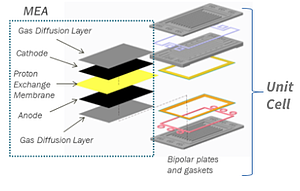 This is then placed between bipolar plates and gaskets to form one unit fuel cell, within a stack of multiple cells. In most designs, the catalyst in the cathode and anode layers is based on platinum (Pt), a very costly precious metal. Platinum can contribute 10-15% of the cost of a fuel cell stack. Unless the Pt content is reduced, it will represent a larger portion of the cost as manufacturing volumes increase. Therefore, platinum is a potential limiting factor in the widespread adoption of fuel cells, and much focus has been placed on reducing Pt content. At Ballard, where we have over 35 years of experience in fuel cell development for real world applications, we are working on the cathode and anode layers to improve both performance and durability. It is known that cathode catalyst performance can be improved by alloying metals such as cobalt and nickel with platinum. However, these metals are not stable in the fuel cell environment: they can leach out during operation, leading to performance losses. We have overcome this problem with a novel catalyst layer design that achieves higher performance with greater durability than conventional catalyst layers. Our high performing design results in a 5x durability improvement compared to a more conventional design using the same alloy catalyst. Ballard continues to actively research and achieve exciting results with advanced catalysts for better performance and durability, while supporting our goal of further reducing Pt content in our fuel cells. In our laboratory, some very promising next-generation catalyst designs are delivering up to 17x higher activity than conventional platinum catalysts. We are also working closely with many of the leading fuel cell academic researchers. For example, in a joint collaborative project with the University of Western Ontario, a method created to encapsulate Pt nanoparticles with zirconia nanocages to protect the platinum is resulting in a 10x increase in catalyst stability and a >6x boost in activity. When insufficient fuel reaches the anode catalyst, fuel cells can fail. If a fuel blockage occurs in the anode flow field in one cell, the affected cell cannot produce sufficient current according to the normal electrochemical reactions. The other cells in the stack will drive this cell to pass current, resulting in a negative cell voltage (known as cell reversal). This can result in rapid corrosion of the anode materials, and ultimate failure of the affected cell. At Ballard, we have developed a proprietary catalyst treatment/anode catalyst layer design that greatly mitigates this degradation, while reducing system control requirements and hence reducing material and manufacturing costs. We have anode designs that are able to tolerate many hours in this situation, compared to just seconds to minutes of tolerance without our proprietary treatments / designs. 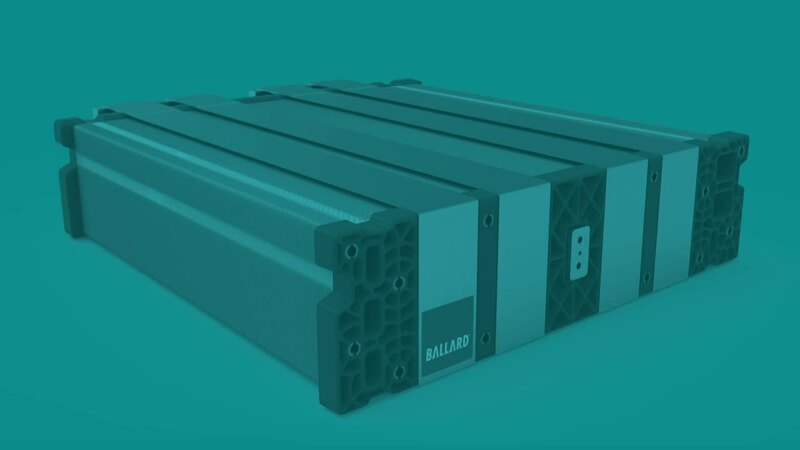 Ballard’s past innovations have resulted in world leading capability, such as the Ballard fuel cells that have achieved over 27,000 hours of operation in Transport for London buses, and are still going strong. As the global leader in fuel cell development, Ballard is committed to developing the next generation of fuel cells. Lower costs and field-proven reliability and durability will enable widespread global adoption of zero-emission power solutions for industry and transportation. Let’s keep pushing toward a cleaner future, together. Download our technical note for an in-depth look at how design and optimization advance fuel cell longevity and performance.